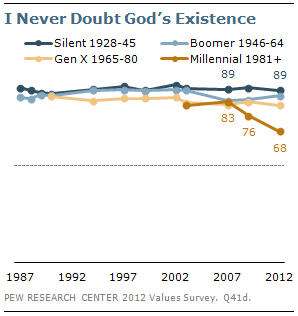 A recent Pew survey reveals that 68% of Millennials, defined as those born from 1981 on, say “I never doubt the existence of God”, which is a decline of 15 points in 5 years. The “Silent” generation, those born between 1928 and 1945, did not see any change when it comes to belief in God in the past 5 years. Although I’m betting you could poll that older generation on any number of issues and rarely find much change in only 5 years. An interesting question in the poll asks “Will we all be called before God at Judgment Day?” The response to this question has not changed much in 25 years. In 1987, 81% responded with “Agree” and 52% responded with “Completely agree”. In 2012, 76% responded with “Agree” and 56% responded with “Completely agree.” That trend is in place across several questions that Pew asked including “Prayer is an important part of my daily life” and “I never doubt the existence of God.” The response of “Agree” is little changed or slightly lower over 25 years, the response of “Completely agree” slightly up over 25 years. As you probably expect, there is a partisan divide when it comes to belief in God with liberal Democrats least likely to believe. In total, 80% of respondents said “I never doubt the existence of God”. For Republicans it’s 92% and for Democrats it’s 77%. It gets more interesting when you break it down further. For conservative Republicans it’s 95% and for conservative Democrats it’s 86%. For liberal Republicans it’s 84% and for liberal Democrats it’s just 60%. Independents come in at 76%. It’s noteworthy that Republicans and conservative Republicans are the only groups that saw an increase in percentage from 1987 to 2012. 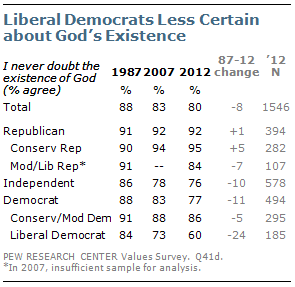 All other groups dropped, the biggest drop was liberal Democrats who saw belief go from 84% in 1987 to 60% in 2012. The “Godless Heathen” constituency is steadily growing in America, and at the same time those of unshakable faith continue to grab hold of government and attempt to impose their religious views on others. It’s not just a partisan divide anymore and it could get ugly before it gets better.